Tue, May 15, 2018, 09:27 am SL Time, ColomboPage News Desk, Sri Lanka. 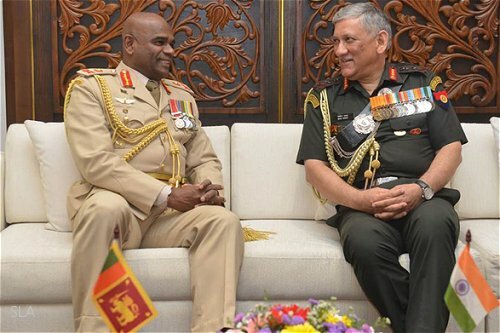 May 15, Colombo: Indian Army Chief, General Bipin Rawat, who is in Sri Lanka on an official visit at the invitation of his Sri Lankan counterpart, Lieutenant General Mahesh Senanayake, has expressed interest in learning how Sri Lanka army troops contributing to nation building and in the successful rehabilitation of former LTTE combatants. General Rawat, the Chief of Army Staff (COAS) of Indian Army called on the Army Commander Lieutenant General Mahesh Senanayake at the Army Headquarters on Monday (14). During the discussions the two army commanders shared views on bilateral and current issues that are relevant to both organizations. 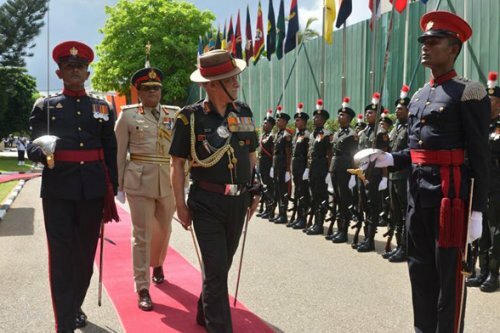 The visiting Indian Army Chief was keen on learning how the Sri Lanka Army has embarked on nation-building roles while transforming its soldiers to be capacity-based and skill-oriented, arming them with globally recognized National Vocational Qualification (NVQ) and related training in different spheres of expertise. The Commander of the Army explained how the much-needed workforce for nation-building is groomed, irrespective of their soldiering in teeth arms, infantry or services by exposing them to this skilled sphere and cited how it has worked in the field of construction, repairs, rebuilding and infrastructure development, for example, pointing to the ongoing reconstruction of agricultural tanks in the Eastern and North Central Provinces. Lieutenant General Senanayake explained that a soldier, generally regarded as a 'destructor' should be more productively used as a 'constructor' instead in peacetime for challenges in nation-building because of their skills. He further enlightened the visiting Army chief on how the Army has been engaged in a wide range of civil-military cooperation projects in the North and East and elsewhere with the sheer intention of bettering livelihoods and welfare benefits of all civilians in respective regions. General Bipin Rawat was also equally interested in the specific model the Sri Lanka Army has successfully tapped in the rehabilitation of former LTTE combatants and also how the Sri Lanka Army's own 5R concept (Rehabilitation, Reconstruction, Reintegration, Resettlement and Reconciliation), has been implemented for revitalization of the country's battered infrastructure during 30-year long conflict. During the cordial meeting, discussions also centered on ongoing training programs for Sri Lankan Army Officers and possibilities of further enhancement of training openings. Both military leaders agreed that the spirits of good understanding and cooperation that prevails between both organizations should be further strengthened and encouraged as friendly neighbors. They both also discussed the importance of evaluating security threats in the region and tackling them through exchange of information and intelligence.